Our research about how construction clients and designers can benefit from virtual reality environments in their project work is published under an Open Access license in the Journal of Information Technology in Construction (ITcon), volume 22 (issue 16). The purpose of this paper is to explore how design reviews can be supported with pre-meeting virtual reality environments. 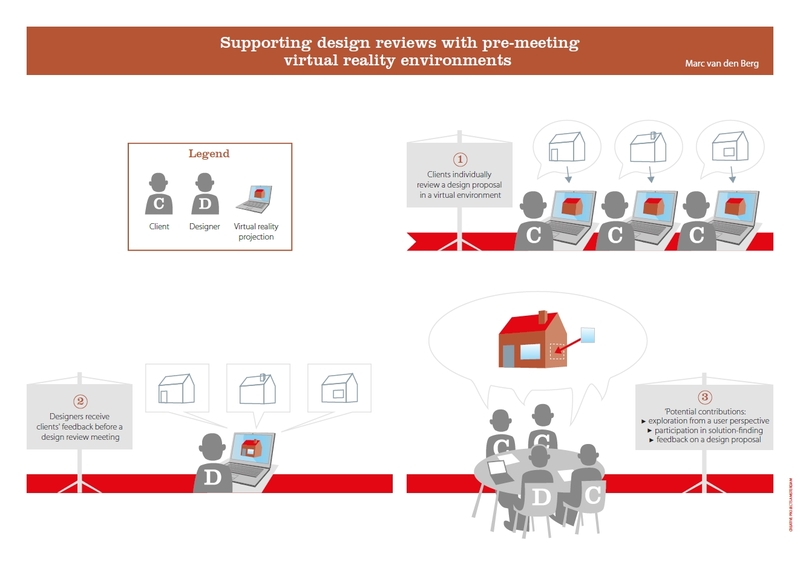 Previous research has not systematically investigated how virtual environments can be used to communicate the design intent (to clients) and to communicate feedback (to design professionals) in advance of review meetings within real-world projects. A prototypical virtual environment that enables clients to individually navigate through and comment on a design-in-progress, aimed to be used before a review meeting, was therefore studied in two typical architectural and engineering design projects. A pattern-matching strategy was applied for the qualitative analysis of the data collected. It is concluded that theoretical expectations and pragmatic realities about the support of pre-meeting virtual reality environments for design review match (yet in varying degrees) in the areas of: exploration from a user perspective, participation in solution-finding and feedback on a design proposal. This paper thereby offers an in-depth understanding about the potential of virtual environment usages in advance of review meetings, which may help design professionals to make a more informed choice about how and why to support design reviews with pre-meeting virtual reality environments. van den Berg, M., Hartmann, T., & de Graaf, R. (2017). Supporting design reviews with pre-meeting virtual reality environments. Journal of Information Technology in Construction, 22(16), 305-321. Read the full article in the Journal of Information Technology in Construction.